The IRS recently released new rules regarding federal estate tax "portability" which allows a married couple to collectively pass nearly $11 million of assets to their heirs without paying estate taxes. Sounds great but beware; certain rules must be followed or the benefit will be lost. Currently, the federal estate tax exemption amount is $5,430,000 (2015). For married couples, there is no limit on the amount of assets you can leave to your spouse without incurring any estate tax (provided your spouse is a U.S. citizen). This is referred to as the unlimited marital deduction. While that can cause a married couple to believe they can shelter $10,860,000 from estate tax, it is not quite that simple. In addition, New York State residents may have a tax liability as the state exemption amount is currently $3,125,000. The key component to portability is the filing of an estate tax return for the first spouse to die. Normally an estate tax return is only filed if the decedent's estate is valued over the estate tax exemption amount. However, in order to elect portability, an estate tax return must be filed even if the assets are less than the exemption amount. It is important to note that the deadline for filing an estate tax return is nine (9) months after the decedent's death. It is also important to note that even if the surviving spouse were to remarry, s/he continues to maintain the deceased spouse's unused exemption (DSUE) from the prior deceased spouse. However, a person can never have a DSUE amount from more than one predeceased spouse. As such, if a surviving spouse with a DSEU remarries, and now their second spouse dies, they lose the DSEU from the first spouse. While portability certainly is helpful for those couples who did not engage in timely estate planning, since it is only available on the federal level and not in connection with New York State estate taxes, the use of trusts remain a more favorable option for New York State residents. As always, you should consult your estate planning attorney for more information before electing portability and to explore your planning options. Example: A married couple has $7,000,000 in assets, with $3,500,000 in each spouse's name. If the first spouse to die were to leave their $3,500,000 to the survivor, the survivor now would have $7,000,000. Without portability, that excess would result in a $600,000 estate tax liability. Before portability, in order to prevent estate tax in such a situation, married couples needed to plan in advance and establish trusts, typically in their Wills, to ensure that the $3,500,000 belonging to the first spouse to die would not go directly to the surviving spouse, but in trust. With portability, even if the surviving spouse inherits the assets directly, by filing an estate tax return for the first spouse to die, the survivor can effectively "inherit" the unused $5,430,000 exemption of the deceased spouse, which is known as the deceased spouse unused exemption (DSEU). Now the surviving spouse has all of the assets ($7,000,000), but s/he also has his/her own estate tax exemption ($5,430,000, which will continue to increase every year based on inflation), and the $5,430,000 DSUE (which will remain fixed). 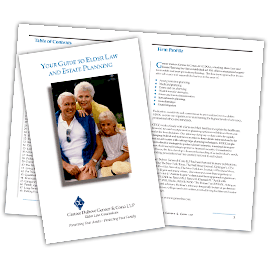 Genser Dubow Genser & Cona is recognized as a leading elder law and estate planning firm on Long Island. The firm was ranked the #1 Elder Law Firm by Long Island Business News for 4 consecutive years (2012-2015) and was a finalist in the 2015 HIA Business Achievement Awards. The firm provides creative advocacy and cutting edge planning strategies and has been featured in many publications including: The New York Times, The Wall Street Journal, Newsday, L.I. Business News, Investor's News Daily, USA Today, The Daily News, The New York Post, Kiplinger's, Reader's Digest and many others. GDGC attorneys have appeared as guests on WNBC-TV, WABC-TV, CNN-fn, News 12, WLNY News 55 and many radio stations including WOR, WCBS AM, WBAB and WFAN.